World Traveler and Entrepreneur Buys Painting! World traveler and creator of opportunities for people that uplift them, Jeff Kline, just bought another one of my paintings: “Where The Wild Ones Live”. Hooray!! 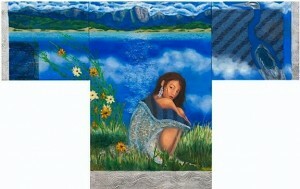 This triptych is in the shape of a kimono, oil with mixed media, 52 x 80″. It looks lovely in his charming Upper Canyon Rd. home. The woman is seated in the exact spot of my Lake Heron (northern NM) campsite. Look for the ducks….